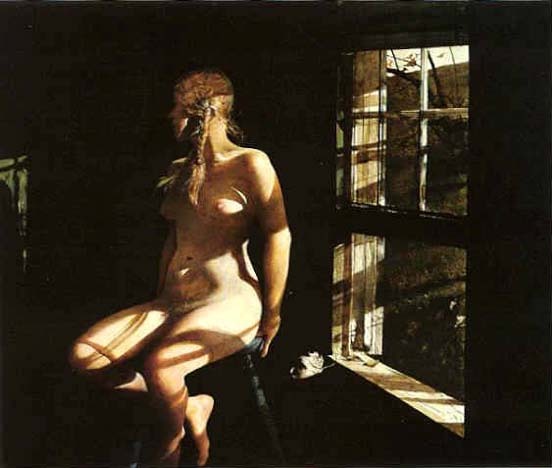 I love this painting by Andrew Wyeth. What a talented man he was! His work is at times almost a photographic snapshot of time. It makes me think of Indian Summer, when the days are still warm but the nights are cool. I imagine his muse sitting on her stool with a slight chill from the breeze, but still a warm back from the sun pouring forth. The first taste of fall flits over the windowsill in the form of a crispy leaf. My Nana, first used the term Indian Summer to me to describe this time of year. When I was little I associated it directly with Native Americans and dreamed of the seasons changing because the Indians living in their cozy teepees willed it to be so, what an imagination I had! Indian Summer is upon us here in England, the sunlight is just beginning to change, you notice a difference in the quality of light almost at times a purer light. There is also a difference in the sounds outside. This entry was posted in Beauty in the Everyday and tagged andrew wyeth, autumn, fall, seasons, summer on August 12, 2009 by jennifermichie.